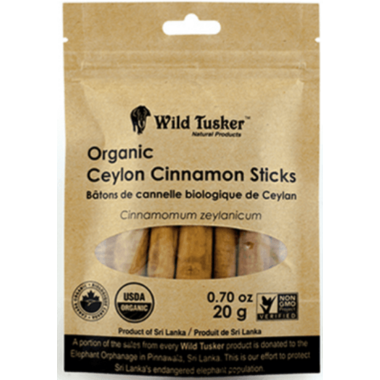 Wild Tusker's Organic Ceylon Cinnamon Sticks have a delicate multilayer texture, exquisite fragrance and a warm sweet taste. "True Cinnamon" is the Ceylon Cinnamon grown in Sri Lanka, while Cassia (Chinese Cinnamon) is the most commonly available "Cinnamon" in most stores. The Ceylon Cinnamon quill is golden brown, multilayered and has a very delicate texture while Cassia has a darker colour and a thicker, hollowed quill. Ceylon Cinnamon has a more refined taste than Cassia and much lower levels of the toxin coumarin. A portion of each sale of "Wild Tusker" brand products goes towards the Pinnawala Elephant Orphanage in Sri Lanka.